White House press secretary Sarah Huckabee Sanders announced Monday that the administration may seek to revoke the security clearances of a number of Trump critics. According to Sanders, the security clearances of former CIA director John Brennan, former CIA director Michael Hayden, former national security adviser Susan Rice, former director of national intelligence James Clapper, former FBI director James Comey, and former deputy FBI director Andrew McCabe are all being examined. After weeks of walk-backs, Trump calls Russia investigation "a big hoax"
Sanders made the announcement after Sen. Rand Paul, R-Kentucky, said Monday that he would urge President Trump to revoke Brennan's clearance. 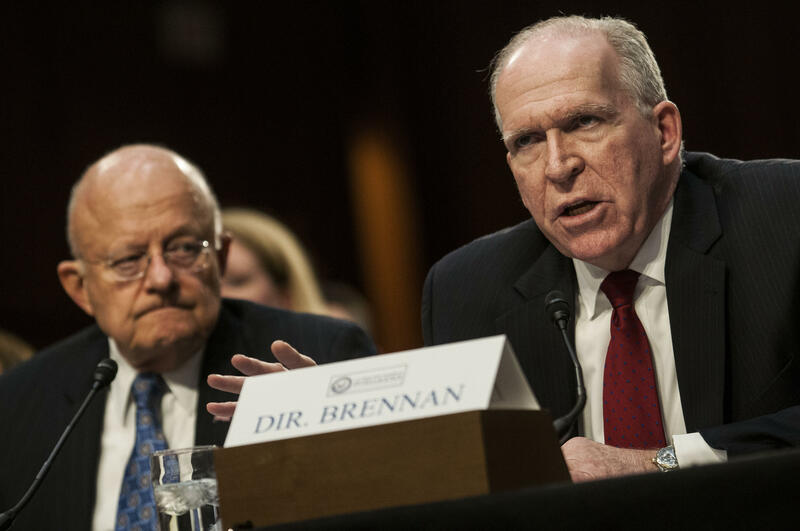 Brennan, who served under President Obama, most recently incurred to administration's ire for describing Mr. Trump's performance at last week's summit with Russian leader Vladimir Putin as "treasonous." Paul tweeted on Monday that Brennan was "divulging secrets to the mainstream media" in order to damage Mr. Trump politically. In his tweet, Paul didn't present any evidence to support his accusation, but the White House appears to have jumped on it regardless. "The fact that people with security clearances are making these baseless charges provides inappropriate legitimacy to accusations with zero evidence," Sanders said. There are many kinds of security clearances and many different types of access. CIA directors and deputy directors, for example, have access to some of America's most closely-held secrets. Your standard CIA employee, while still have a high security clearance by federal government standards, does not have the same level of access. And when a CIA director leaves, he or she is bumped to down to the basic level of clearance. "When I walked out the door, I was actually removed from access to a whole bunch of extremely sensitive material because there was a determination made that I didn't need to have that -- the government didn't need me to have that," former Acting CIA Director Michael Morell told CBS News on Monday. "But I kept that basic level of security clearance." "It's not just a courtesy," Morell said. "For as long as I have been aware, which is probably two decades, former senior officials have kept their clearances. And the purpose is not to benefit the individual. It's to benefit the government. So, for example, I go into CIA regularly and I help them think through issues, I talk to people, I'm there to assist in any variety of ways. I also serve on a government commission that I could not serve on without having my clearances." Morell also said that he has never asked for a briefing "on anything" since leaving the government. "I've been given a lot of briefings because a director or a deputy director or another senior official wanted me to know something because they wanted to ask me a question or get my reaction to something, but I've never asked. So I don't know what the reaction would be if I asked 'hey, can I get a briefing on the Russia investigation?' I think the answer would be, 'no, Michael, you can't.'" In the case of former CIA directors, the agency "holds" their security clearance and renews it every five years for the rest of their lives. However, that requires former CIA directors to behave like current CIA employees if they want to keep their clearance, which means avoiding travel to certain countries and generally living in a manner above reproach. Other former government employees can keep their security clearances if they move to a private sector job where they work with classified information, such as at a defense contractor. The company would then apply to the government for someone to keep or receive a security clearance. The security officers at the different agencies then grant or rule if someone can keep their clearances. Hundreds if not thousands of private companies apply for their employees to receive security clearances. In an interview with Bloomberg earlier this year, the CEO of Lockheed Martin said that 60,000 of her employees have a security clearance of some kind. There is also a substantial backlog of people awaiting their security clearances. Last fall, some 700,000 people were still awaiting a security clearance -- including some top White House officials. In 2017, the General Accountability Office said that security clearances constituted a "high risk" for the U.S. because so many people have them. According to the Office of the Director of National Intelligence, roughly 4.2 million Americans had or were eligible to have a security clearance as of late 2015. Morell says that it's fair to ask whether everyone who has a security clearance should have one, but doesn't think that's what the Trump administration is doing here. "It's not inappropriate to ask the question -- does doing this make sense? Does allowing former senior officials to keep these clearances make sense...it's not an unreasonable question to ask," Morell said. "That's not what [Mr. Trump] is doing here. This is all about taking a shot at former senior officials who are criticizing him. That's what this is about. Nothing else." According to McCabe's spokesperson, he no longer has a security clearance because he was fired. The same apparently is true of Comey, according to his friend Ben Wittes, because he was also fired. Meanwhile, Hayden said that revoking his clearance wouldn't have any effect on what he says. "I don't go back for classified briefings," Hayden, who served under President George W. Bush, told CBS News on Monday. "Won't have any effect on what I say or write." CBS News Ed O'Keefe and Olivia Gazis contributed reporting to this story.